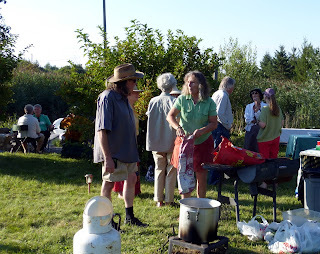 This past Sunday, I went to a wonderful late August party. My friends Susan and Vlasta held the party at their beautiful place in the country. 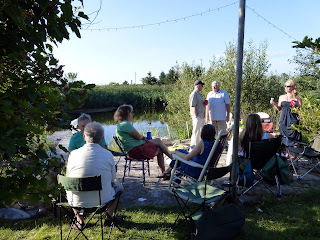 People sat near the pond for a while and soaked up the gorgeous evening. It was one of those times where you realized summer was coming to an end but we were happy just enjoying what was left of it. Then it was time to eat. Susan and Mac got ready to barbecue burgers and boil dozens and dozens of cobs of corn for the hungry masses. Mmmm! It was yummy! Food always tastes so good outside on a late summer evening. As the sun began to set, a bonfire was lit and people gathered to chat and watch the flames. 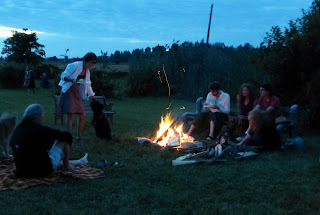 Food, friends, and a last beautiful summer evening. What more could one want!